I call this the "in-between stage." 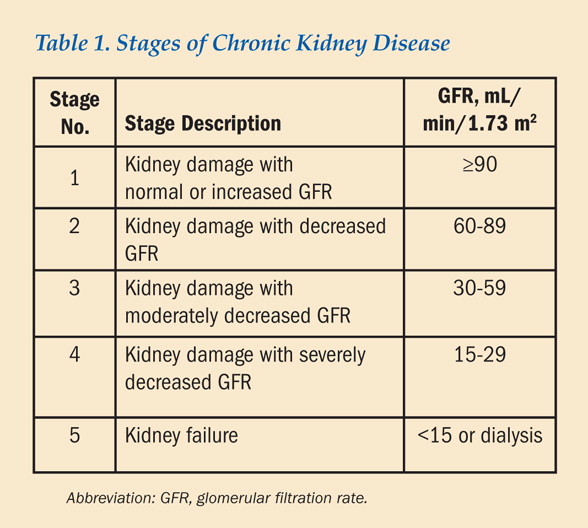 Kidney function is down to 60 to 89 percent of normal, and the GFR ranges from 60 to 89 ml/min. Compared with stage one, there is a decline in overall kidney function and proteinuria may or may not be present. At this early stage, close monitoring of your kidney function and a plan of action, which may include a consultation with a kidney specialist, should be initiated to prevent progression to the next stage. This is the "fuming point stage," because injury to the kidney beyond it is usually irreversible. Kidney function is 30 to 59 percent of normal and the GFR is 30 to 59 ml/min. At this stage, intervention by a kidney specialist is strongly recommended to delay the course of progression. If your primary care doctor has not already referred you to see a kidney specialist, he should do so now. Also at this stage, the eGFR on your blood work will report a specific value. (At stages one and two, the eGFR will only report >60 ml/min.) In stage three, other body systems are affected, as well, and you can begin to see changes in blood and bone health because of the advancement of kidney disease. Remember that your kidneys make a hormone called erythropoietin (erith-ro-po-eaten), which stimulates the body to make more red blood cells. At stage three of kidney disease, the kidneys may not produce enough of this hormone. When this happens, there is a risk of developing a low blood count, which is commonly called anemia. This condition is confirmed by a hemoglobin (heme-o-glow-bin), or Hgb level blood test. As of this writing, an acceptable Hgb level for someone with CKD is between eleven and twelve. This accepted value, however, may change in the future as the guidelines are being re-evaluated. Signs and symptoms of anemia can include fatigue, weakness, shortness of breath, and dizziness. If you experience any of these symptoms, call your doctor immediately. Also, note that people with certain conditions such as diabetes can have anemia even before reaching this stage; they may have a low Hgb level as early as stage one. Bone health is maintained through the interaction of vitamin D, calcium, phosphorus, and a hormone called parathyroid hormone, or PTH. The kidneys' role in all of this is to transform vitamin D. This changed form of vitamin D regulates the amount of PTH made, which in turn regulates the amount of calcium and phosphorus needed by the bones. At this stage of kidney disease, vitamin D is not fully transformed; therefore, PTH goes unregulated, which can drastically affect bone health. I'll skip Stage Four temporary. You can read a detail analysis on my next post. At this final stage of kidney disease, kidney function is less than 15 percent and the GFR is less than 15 ml/min. At this point, you may or may not be undergoing dialysis treatment. Dialysis is usually started when kidney function is less than 10 percent (or GFR < 10 ml/min), although people with diabetes-related kidney disease may be started when their kidney function is 15 percent or less (or GFR < 15 ml/min). As with most things, however, there are exceptions to this rule. In certain circumstances, if you are feeling good and not experiencing any of the uremic symptoms discussed earlier, dialysis may be postponed; however, your blood work will still be followed closely by your doctor and he will likely ask you to follow up with frequent office visits. Similarly, if you are on the cusp of starting dialysis you will be monitored closely with frequent follow-up visits. The stages of chronic kidney disease are indicators of your kidney function. At each stage, the goal is to work with your doctor to maximize kidney function and prevent progression to the next stage. You should vigilantly review your blood work with your doctor, and when applicable, be referred to a kidney specialist. Your kidney health depends on it. To find out more, you can check out 5 Stages Of Chronic Kidney Disease.